Introducing the TrashPro Car Trash Can Organizer by JACO Superior Products. Just read our 5-star reviews and discover first-hand why so many drivers look no further than JACO Superior Products for premium quality car organization for the many miles ahead! * Impress your passengers with a clean & tidy car by stashing the mess away in our industry-leading 3 gallon leakproof/waterproof interior litter bag liner. * Crafted from the finest 600D oxford polyester, you can feel the difference! * Durable steel-wire metal top frame creates a foldable lid, allowing the bag to retain its shape and ensure it stays shut via heavy duty closing strips. * 100% Lifetime Satisfaction Guarantee when you order from us today! Crafted from strong & sturdy 600D oxford polyester, the TrashPro is built to last a lifetime! Say goodbye to spending money on flimsy, cheap auto garbage containers that rip & tear after a few weeks. Tired of spending money on flimsy, cheap auto trash bags that rip and tear only after a few uses, only to have to buy yet another one? 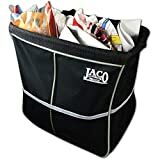 Just read our 5-star reviews and discover why so many drivers look no further than JACO Superior Products for premium quality auto organizers built to last for the many miles ahead!